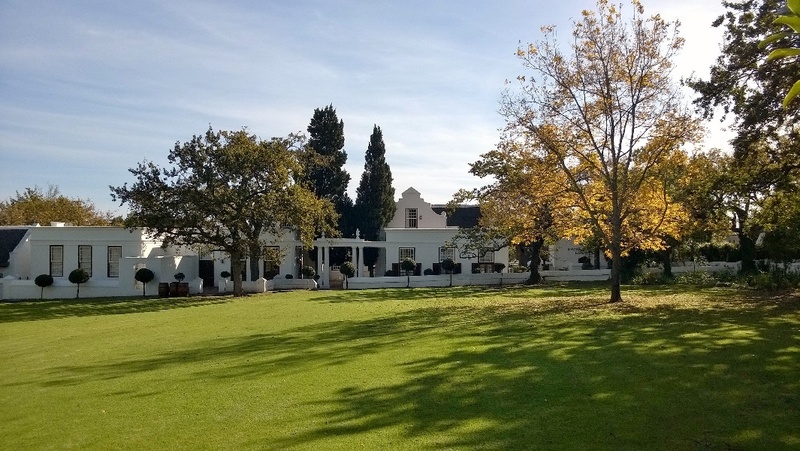 Set on one of the Cape’s earliest and most prestigious wine estates, The Lanzerac Hotel in Stellenbosch offers a masterful combination of polished current-day luxury and age-old grandeur. Set in the exquisite Jonkershoek Valley against a breathtaking mountainscape and fringed by vineyards – which we’ve just enjoyed in the crisp caramel cladding of late autumn – the Lanzerac is an excellent choice for a luxury getaway in the Stellenbosch winelands. 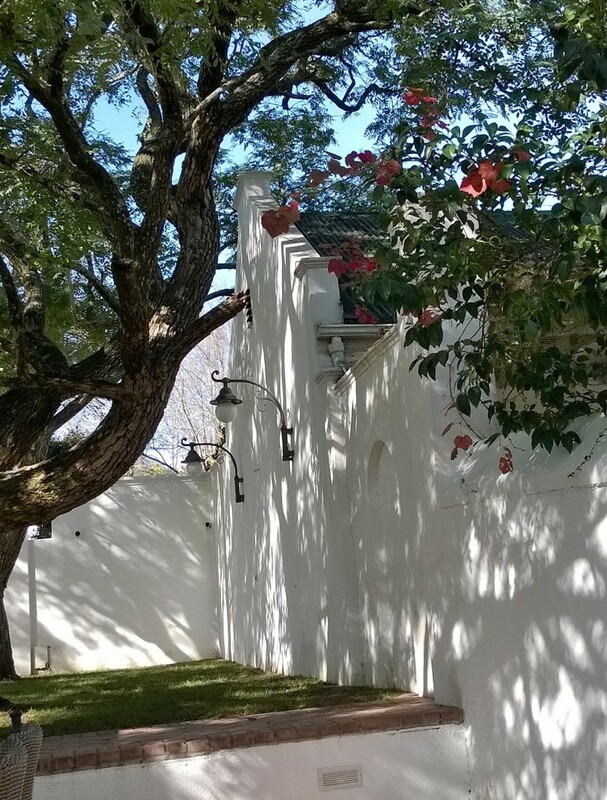 Hundreds of years before The Lanzerac got its present name, its first vineyards were cultivated and its exquisite Cape Dutch buildings constructed. Aptly, the farm was first called Schoongezicht (beautiful view) by its first owner Isaac Shrijver, to whom the land was granted by the Governor of the Cape in the late 17th century. The first vines were planted in the late 1600s, and over several centuries since then, the farm has continued to flourish as a wine producer of distinction. In 1958 The Lanzerac became operational as a hotel. 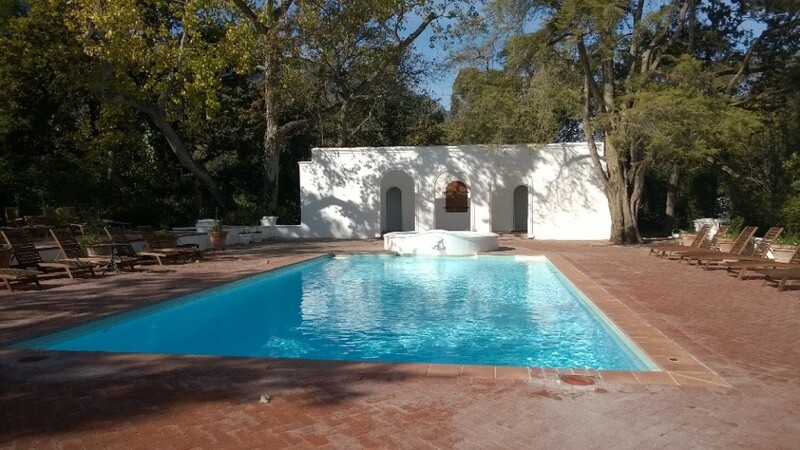 The historic Manor House remains, architecturally, the focal point of the estate. Standing in gracious repose, it’s the majestic sight that greets you as you enter the grandly pillared estate. We stayed in a large and princely Courtyard Suite, with sumptuous lounging areas inside and out, and a huge dream bathroom. It was a beautiful space. equipped with everything we needed, and more. 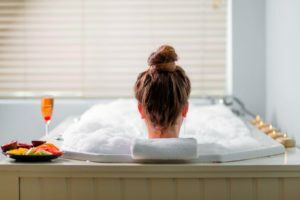 All rooms have underfloor heating, mini bars, beverage stations, air-conditioning, safes, hairdryers, DSTV satellite TV with selected channels, international plug points, and heated towel rails. Lanzerac wines, most deservedly, are celebrated far and wide. No visit to The Lanzerac checks all the boxes of pleasure without a visit to the Tasting Room. Several different tastings are on offer, including a chocolate tasting paired with five premium wines. 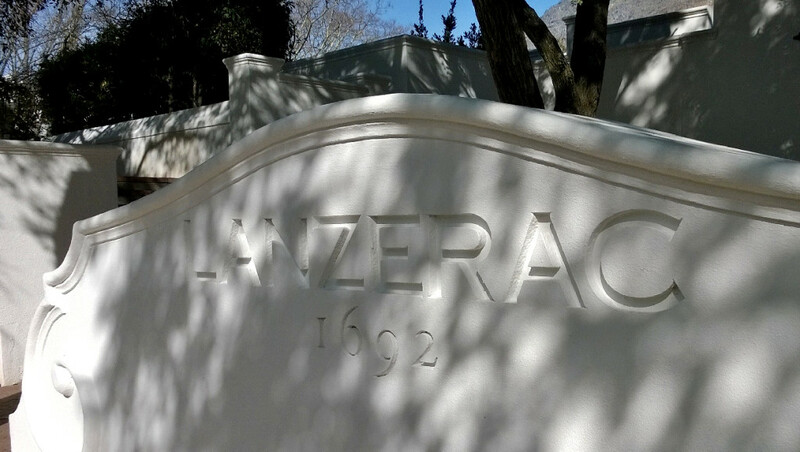 Chocolate-lovers please note that The Lanzerac has its own tantalizing range of handmade slabs. We tried the White Chocolate Lanzerac Chardonnay with Lemons and Lime – a marvellous treat that we will definitely repeat! 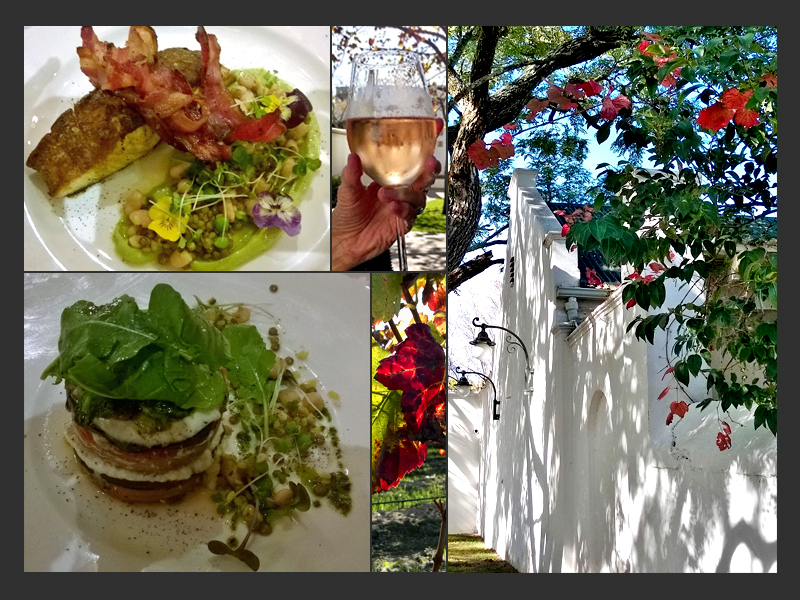 We loved the food experience at Lanzerac, which included a lovely al fresco lunch at The Deli in the mild autumn sunshine, squirrels at play in the trees overhead. 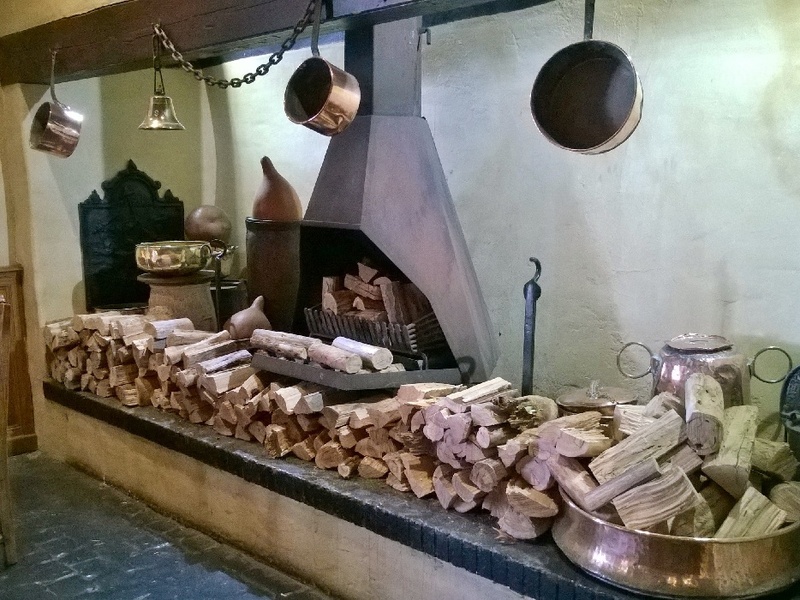 We had a memorable dinner at The Governor’s Hall restaurant – superb food and wine, and wonderfully obliging service. Both the turmeric-rubbed linefish and the specially prepared brinjal stack for our vegetarian were leave-a-clean-plate scrumptious. Had we stayed longer, we would also have visited the Terrace Restaurant and Lady Anne Courtyard. 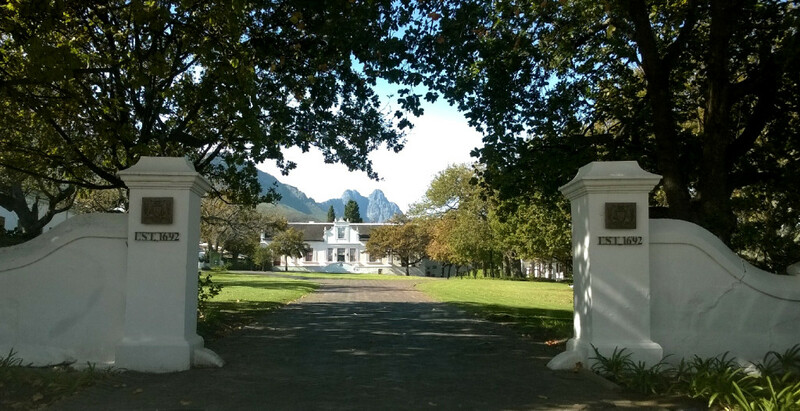 The Lanzerac really is a world unto itself, and this is part of what makes it a fabulous getaway destination. Weekend visitors need not leave the estate, where there are sprawling lawns and vineyards to stroll, an array of taste sensations to be had, as well as supreme spa offerings. 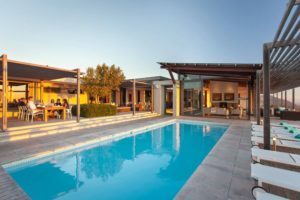 Three separate pool decks provide a choice of lounging environments, all of them serene and inviting. 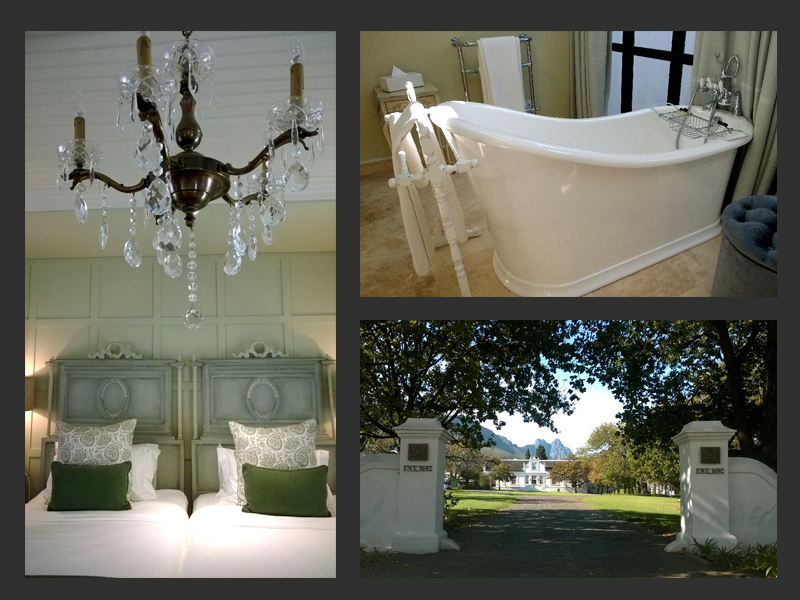 Mail us to book your stay at The Lanzerac or elsewhere in South Africa, or call us on +27 21 797-7122.